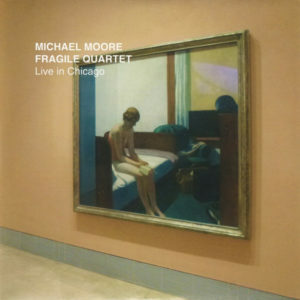 “Moore’s main in-semble since 2007 is the Fragile Quartet, with a couple of conservatory-trained players a generation younger than the Michaels, pianist Harmen Fraanje and bassist Clemens van der Feen. The leisurely Live in Chicago is their fourth Ramboy (after Fragile, Amsterdam and Easter Sunday), nicely recorded by David Zuchowski before a considerately quiet audience at A’dammers’ newest second home, Constellation. The leader’s clarinet ballads have a calm depth and beauty he’d been honing before he heard Jimmy Giuffre’s melancholy little groups – not that Moore didn’t take to that music when he did hear it. Any listener longing for clarinet in a Giuffrean vein should delve deep into the Ramboy catalog (starting, say, with the 1993 Moore-Fred Hersch-Mark Helias trio Chicoutimi). Moore’s round full-moon chalumeau tone may be the loveliest clarinet sound around, but he doesn’t shy away from the upper register the way Giuffre did, and he’s got a scrappier sensibility. There are a lot more birdcalls in his conception; the avian abstractions can give spare bits a Morton Feldman bite (“Gauzy”) or cool distance (“Go to gate,” “In the moon”). The rhythm players are crucial to those effects; Fraanje and Van der Feen show commendable restraint – no agoraphobia – and the touch to dramatically foreground or background their contributions in the moment. “Sonora” is that plaintive sonority with a beat, from Vatcher on what sounds like his egg-sized shakers, before he raises up his trademark hollow-platform march beats and crossed-up cross-rhythms. The drummer likes very small and quiet gestures, but when he puts the pots on in a straight ahead setting, he can be an effectively disruptive presence, careening a little within his lane. He has a very elastic ride cymbal beat. Vatcher loves a broad range of percussive possibilities, lugging around a dulcimer/zither to hammer on, or to rotate a cymbal against the strings. He uses it to shimmering effect on “A few seconds (of overwhelming harmony)” where clarinet’s backed by high pure long tones involving EBows that set strings a-humming, and Van der Feen’s precisely bowed bass harmonics.